Our Eczema Management System consist of 4 superior products. 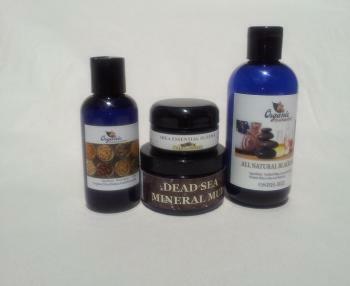 Liquefied Black Soap, All Nature Witch Hazel Extract, Dead Sea Mineral Mud and Shea Essential Eczema. This System is designed to help you overcome the symptoms and visible affect of Eczema. S. E. Eczema natural treatment is excellent from Face to toes. Dead Sea Mineral Mud is the black mud harvested from the banks of The Dead Sea. Dead Sea Mineral Mud contains 26 minerals including Magnesium, calcium, bromine and potassium. Twelve of The Dead Sea minerals do not exist in any other sea or ocean in the world. Dead Sea Mineral Mud is anti-inflammatory and helps relieve the symptoms of Eczema. Shea Essential Eczema is Certified Virgin Organic Shea Butter blended with our specialized Organic Botanical Extracts, Organic Seed and Organic Essential Oils designed to have a anti-inflammatory, anti-infectious, anti-bacterial and deep moisturizing effect on the skin which eliminates the drying and itching symptoms associated with Eczema. S. E. Eczema natural treatment is excellent from Face to toes. Organic Shea Butter is Organic UV protection. One of the Organic Botanical Extracts we use in this formulation is Licorice which the follow study confirms it’s effectiveness at treating Eczema. J Dermatolog Treat. 2003 Sep;14(3):153-7. Source: Department of Pharmaceutics, Mazandaran University of Medical Sciences, Sari, Iran. November 29, 2012 at 3:38 PM Hello My name is Michael and I have been using the Shea Butter Hut products for at least six months now. I have had really good results with it; black soap really cleanses my oily skin and leaves it feeling so clean and smooth. I have to tell you I have had a problem with eczema for a while and since using the Dead Sea Mineral Mud I have not had one problem with eczema. Isnâ€™t that amazing you can have a problem for years and try so many different products and Bam all at once you get the right thing and your problem is gone. A lady was talking to me one evening and placed her hand on my face and said â€œwow your skin is so nice lookingâ€� now you know Iâ€™m sticking with these program lol. Where have you all been all my life? Khalil Frazier â€“ March 5, 2013: I love this system! I have a 6 year old daughter who is a jr diva and her eczema came on suddenly. As soon as I see her scratching, I give her a bath with the black soap from head toe and apply the shea essential eczema to the affected area and the itching stops immediately! Usually after two application she is totally clear. Then I use the black soap from head to toe and shea butter w/essential oils daily to help minimize her break out. This system is excellent with not side effects!